JP had his round 2 play off game tonight! They got to play the only team they lost to this season again and they won! The picture on the left was JP at the end of the game after he shook the other players hands at the end of the game. He came running off the field shacking his helmet in the air "just like the real college players"! HA! Oh My! The picture on the right was when we scored our extra point...just in case the refs needed some help with the call! HA! :) Silly BoY! 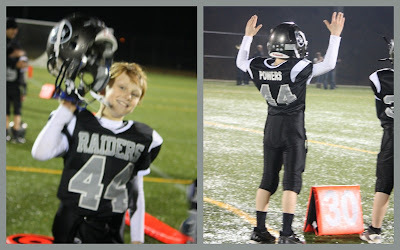 Way to go Chelsea Raiders!!!! Championship game this weekend!!!! Hoping these boys can do what NO Chelsea team from high school on down has done this season... bring home the championship!!! !